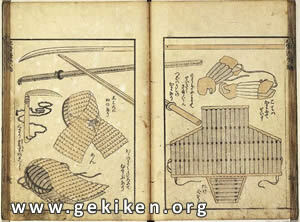 The picture on the right is from Hokusai Manga, and depicts the equipment used in Gekiken back in 19th Century. Here's some observations. The Shinai is not the usual ones you see in modern Kendo today. It is a fukuro-shinai, with leather wrapped over it. Though there is a Bokken (wooden sword) in the illustration, it is unlikely that it's used for fencing with one another. No drawings or illustrations have depicted anyone using the Bokken for fencing, and furthermore it's too dangerous even with armour on. The Naginata, long bladed polearm, isn't the split-bamboo type as seen in Atarashii-Naginata today. The old photograph on the right shows a fencer using what seems to be a wooden Naginata. With a length that delivers attacks at higher velocity, plus made of wood which is a hard material, the Naginata-wielder needs to have good control, or I can only pray for the safety of the fencer who's facing against the Naginata. The Dou appears to be designed so as to flexibly wrap around the torso of the fencer. There's even built-in groin protection, that's a good thing! The facemask is made of metal grills, while the material used for the protecting the rest of the head seems to be made of softer cloth than what we see in modern Kendo's Men today. The Kote have distinctive stripes of protective material at the forearm area, which is observably different from modern Kendo's. Reproduction of content is strictly forbidden without prior approval.